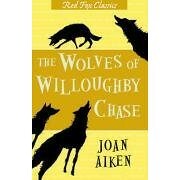 As a child I avoided The Wolves of Willoughby Chase for precisely the wrong reasons. Laughable reasons even. When I was young, girls were constantly falling for animal books. Cutesy dolphins. Adorable horses. And sweet little wolves. Me? I avoided such books like the plague. Ridiculously so, to the point where I looked at the image of the slathering Edward Gorey hellhounds on the cover of this book and honestly thought to myself “wolves = girly = bad.” I never said I was a bright child. Clearly I would have adored this book back in the day. One can only hope that there are brighter boys and girls out there willing to give a dark little title like this one a fair shake. She also makes no bones about her primary influence. “I think I got the idea for writing melodrama for boys and girls because when I was young, I had a great deal of Dickens read aloud to me. Of course, he is the prime example of this kind of melodrama. I think this had a very strong influence on my writing. 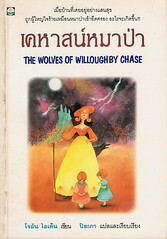 The historical period of The Wolves of Willoughby Chase and the others is imaginary, although the trappings are all fairly genuine English nineteenth-century ones. This again, I think, was heavily influenced by Dickens. . . . The names of my characters have a strong connection with Dickens. Miss Slighcarp and Mr. Gripe, for example–this is the kind of name Dickens uses a great deal. A lot of my names, in fact, I tend to think of in dreams. I just leave the business to my subconscious, and it produces some fine names.” One wonders if J.K. Rowling works similarly. In a way, this was the first book in a series too. 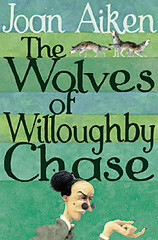 As Ms. Aiken herself said, “When I planned Willoughby Chase I hadn’t thought at all of following it up with the other books. But when I finished it, I’d enjoyed it so much and my publisher seemed to enjoy it, that it seemed the natural thing to go on and write a sequel.” The books in general take place in an alternate history of Britain where James II never got deposed. Strangely, the series never seemed to ever acquire an official name. 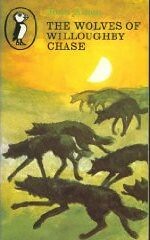 Some refer to it as the “Wolves Chronicles” but that title never really stuck. Maybe that’s why the books are not particularly well known here in America. 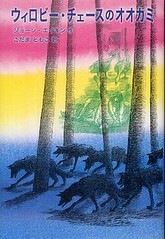 The subsequent books in the “Wolves” series include (and this is in narrative rather than publication order): Black Hearts in Battersea (1964), Nightbirds on Nantucket (1966), The Whispering Mountain (1968), The Stolen Lake (1981), Dangerous Games (1999), The Cuckoo Tree (1971), Dido and Pa (1986), Is Underground (1992), Cold Shoulder Road (1995), Midwinter Nightingale (2003), and The Witch of Clatteringshaws (2005). This year, of course, marks the book’s 50th anniversary. We’ve seen a lot of celebrations out there for A Wrinkle in Time. It would be nice if someone properly celebrated this book as well. For cover artists the idea of evil wolves is hard to pass up. As always I love the theatrical posters. And artist Julianna Swaney made her own book jacket image, which I quite like. I started watching the trailer for the 1989 movie of this book with a smirk upon my face. But as it goes on, it gets quite exciting. It runs the risk of giving away the entire story, but all in all this appears to be a pretty faithful adaptation of the original book. Here’s the trailer. Extra Fun Fact: Richard O’Brien, normally known as Riff Raff from Rocky Horror Picture Show, is in this film. That almost makes me want to rent it right there. I didn’t read this book as a child either, although I’m sure I would have loved it. Joan Aiken’s daughter Lizza wrote a wonderful piece for the May/June 2009 Horn Book that prompted me to read it. (Couldn’t quickly find a link to this.) Since then, I’ve been recommending it right and left. Thanks for this wonderful poll, Betsy! I’m so pleased that this made the list!!! (The first book I voted for to appear.) I was afraid it wouldn’t, because I didn’t imagine that it would be so high — huzzah for Aiken! I loved the sequel, Black Hearts in Battersea, even more (though that may be because I owned it and therefore re-read it many times – but it had an excellent plot, and also introduced intrepid Dido Twite, and resourceful Sophie). Read a couple of the later sequels as an adult and wasn’t crazy about them, but I will try them again (and the ones I haven’t read – I see the final one got an excellent review). For younger kids, I highly recommend Aiken’s short stories, beginning with the collection A Necklace of Raindrops. Magical and unusual and fairly gentle. And for Austen fans, I recommend Aiken’s Austen “sequels”, including Jane Fairfax and Mansfield Revisited. She has a good touch with the characters, and mainly develops the lesser-known ones, which is more enjoyable than reading another version of the Elizabeth and Darcy story (which isn’t to say I haven’t done that as well). Also, last I looked (when you did this poll before and I learned there had been a movie), I couldn’t find the movie anywhere. But now it’s streaming on Netflix!! I know what I’ll be watching one night this week. Another book that was recommend to me as an adult and left me thoroughly miffed that I’d never discovered it as a kid. So good! I’ve been reading Aiken’s The Serial Garden, too (or was, until I lent it to a friend), and I find those stories delightful. Genevieve – I think I’m going to have to try her Austen sequels now! If my fifth grade self had been voting, I probably would have put WOLVES, BLACKHEARTS and NIGHTBIRDS on my top ten list. Of course, so many wonderful books have come along in the last mumble, mumble years….